There is a new product line joining our Empress™ Family – Valio™! 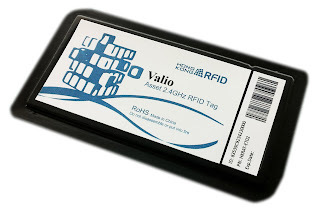 The first member of this new line, named Valio Gadget Tag (PN: HKRAT-ET02), will be launched soon. Just like applying labels or asset naming plates, any kind of devices can be tracked by our Gadget Tag because of its thin and light design. Not only is the Gadget Tag suitable for large machines, it is also suitable for small electrical appliances like notebooks, tablet computers and even smart phones. When the tamper-proof sensor is triggered, signal will be emitted to the Empress™ Active Reader preventing unauthorized removal of the tag from the device. Gadget Tag also responses to reader constantly by sending out the unique ID to facilitate real time tracking within the monitoring range. Properties can now be properly taken care of with the adoption of Gadget Tag. Stay tune for the release of the Gadget Tag!